It’s The Oscars! This is MY Superbowl Sunday. I’m home in front of the TV with my snacks and a glass of champagne, or two. I didn’t see as many of the movies this year and I’m sorry about that. But I do believe there is an Oscars next year so we can try again. I’m in love with a new social networking site…actually, I don’t know how long it’s been around. It’s been around in my world for about 4 months. 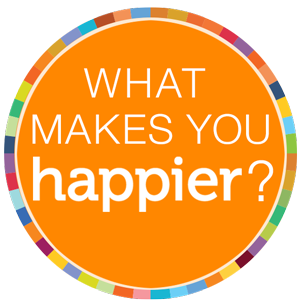 It’s called HAPPIER.COM and it’s like Twitter with a Happy Face. You are encouraged to post only things that make you happy, grateful and feel good. No bitching and moaning. (They’ve got all this scientific data to defend their Happy Stance, if you’re into that, you can read all about it on their website.) It’s designed for those people who are just born happy and those people who want to be happy. It’s been my “go-to tool” for chasing away the Blue Meanies for, oh, about 4 months now. I love scrolling through and seeing all the things that bring contentment to people, worldwide. 99% of my Happier friends, I’ve never met and I probably never will. But, I love them. There. I did a little Happier gush. If you want to become part of the Happier World, you can. Then you can find and follow me as Cammy Williams. And if you follow me, I can folllow you and add to the Happier Family. Okay, that’s a little toooooo sweet. Well, have you? It goes great with coffee. And speaking of his Purpleness and my Imagining Rain blog of a few blogs back(get it? Purple Rain? heeheehee), here’s 2 minutes of the wet stuff that I filmed yesterday. Enjoy! There is no lovelier sound in the world than that of rain outside an open window! And now, whenever I feel like whining that I can’t open a window and listen anymore, I’ll just pop onto YouTube and listen this this video and watch the big, heavy drips stream down. That a rhodie starting to bloom? The pink tree that you show about 2/3 of the way through? No, it’s too early…only red rhodies bloom as early as March, so what is yours? Lovely Sunday morning interlude, thank you! I am happy seeing my dear friend Cammy is so happy. You are so sweet, Tammy!